← A Picture Worth a Thousand Words! “How long is this going to take?” I asked. “As long as it takes,” he said. Whenever my husband answers a question like that I feel like throwing things at him. Over the last thirty-five years or so, Charles has answered that question the same way. We had just started dating. I wanted to go out for dinner and then go dancing, instead my boyfriend was busily trying to change a transmission in his hopped up muscle car. I sat on the pavement, bored, handing Charles wrenches and sockets when he asked for them. “How long is this going to take?” I asked and yawned. “As long as it takes,” he shouted from under the car. We had been married for five years and I was expecting my first baby. I was as big as a mountain and baby was overdue…waaaay overdue. Baby loved “womb service” too much I suppose. The doctor tried to induce me not once, not twice but five times but finally decided to send me home to wait until my body decided to go into labour on its own. “How long is this going to take?” I asked my husband in exasperation. We were all piled into a motorhome and enroute to Los Angeles. We had never traveled there before and certainly not with a “tweenie” and two preschoolers. My husband called it our “great adventure” but after driving for hours and hours with restless children whining every few minutes, “Are we there yet?”, I was ready to turn the rig around and go home. My husband gave me that “Et tu Brute?” look and then glared back at the road. “As long as it takes,” he growled. We live in a world of fast, fast, fast. Everything in our world is fast-paced. We want instant results, instant gratification. We don’t want to wait. We want everything right away…high speed internet, microwave dinners in two minutes or less, rapid transit, super-stock, jet-propulsed…zoom, zoom. We put those expectations on God too. “As long as it takes,” the Lord answers. “As long as it takes,” the Lord responds. Then I realize what I have just said. 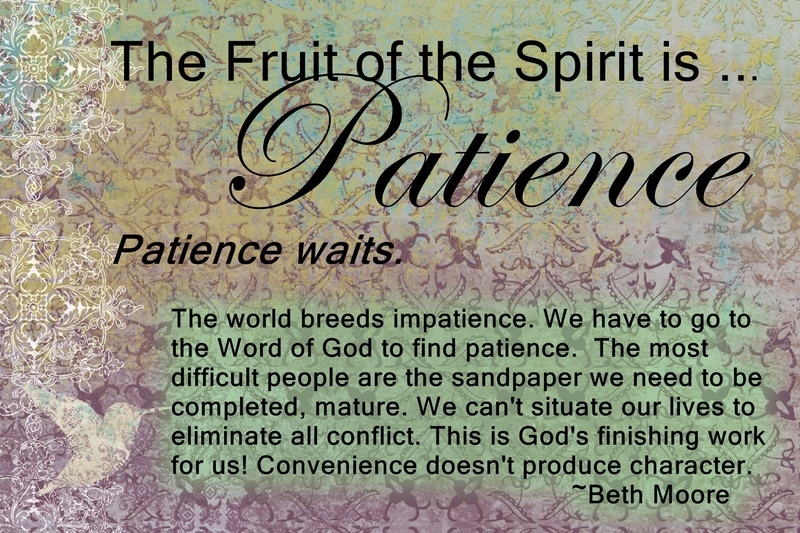 Did I just ask for patience and then expect God to “hurry up” with that?! I suppose I’m not quite there yet. This entry was posted in Inspiration & Devotion, Proverbs 16:9 - Journey Thoughts and tagged Challenges, Christianity, Devotion, Family, Godspeed, Inspiration & Devotion, Life, Patience, time. Bookmark the permalink.